FIRE ISLAND (WABC) -- Authorities say three men were rescued from a rip current Friday afternoon at Ocean Bay Park on Fire Island. According to Suffolk County Police, Peter Giorgianni, 62, of Babylon, was swimming in the ocean and caught a rip current which pulled him out to sea. Michael Baruch, 22, of Smithtown and Kevin Mannix, 49, of Nesconset, attempted to reach Giorgianni, but also caught a rip current and were brought to sea. 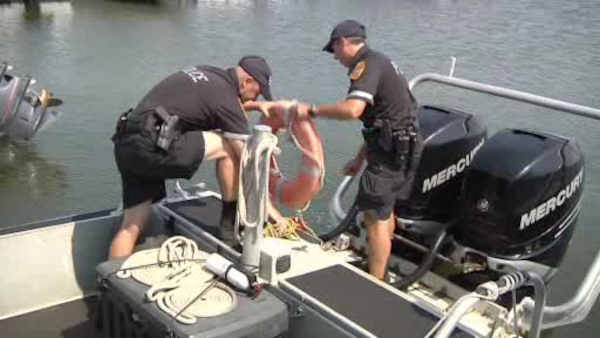 Suffolk County Marine Bureau Officer Charles Giardella grabbed a life-ring and rescue line and entered the water with an off-duty lifeguard from Point O' Woods. Officer Michael Malone stayed on shore to coordinate the rescue and maintain communications. Police say Giardella and an off-duty lifeguard swam approximately 100 feet past the breakers, when the officer passed the life ring to Giorgianni. Giardella swam back to shore dragging the life ring by the rescue line, pulling Giorgianni through the rough waters. Giardella re-entered the water and again swam out through the breakers to pass the life ring to Mannix and Baruch to assist them to shore. "He grabbed the life ring again and jumped back in, and was able to assist the second group to help them against the rip current," said Malone. "They were very thankful because they were out there by themselves and there was no way to get back in," said Giardella. Surf height at the time of the rescue was approximately 4 feet. Giorgianni told the responding officers that he did not think he would have survived if they had not reached him. Giorgianni was transported by Suffolk County Police boat to Marine Bureau Head Quarters in Great River, where he was transferred to Islip Exchange Ambulance and brought to Southside Hospital in Bay Shore for treatment. Mannix and Baruch refused medical attention at the scene. To get out of the rip current, swim parallel to the beach. When out of the rip current, swim at an angle away from the rip current and toward shore. If you can't escape this way, float or calmly tread water.